I have wanted to make a honey bun cake for a very long time. I got my chance recently when a new recipe I tried was a complete fail. I was making a coffee cake and the pan size recommended in the recipe was entirely too small so the cake did not bake properly, even though the toothpick test tested done. So, with company coming, I had to act fact and work with what I had on hand. Searching my cookbooks , “to try” file and the internet I was reminded of this cake that could really double as dessert although I served it for breakfast. This is a recipe that comes together quickly, with little mess and you probably have everything on hand. It’s a great recipe for a larger group and would be perfect to take into co-workers as a surprise. 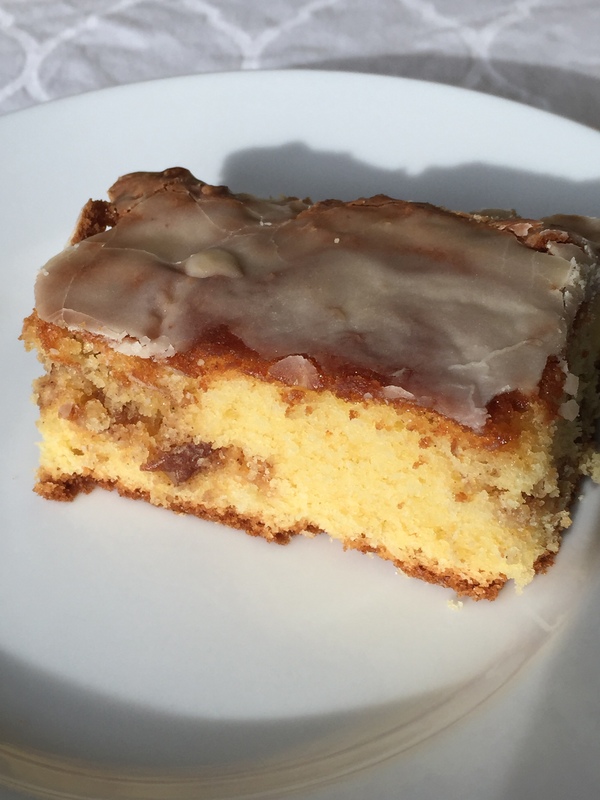 So the week 24 recipe in the 52 Week New Recipe Challenge is honey bun cake. Enjoy! Heat oven to 350 degrees F (or 325 degrees F for dark or non-stick pan). Spray pan with baking spray with flour or lightly grease and flour pan. Set aside. In a small bowl combine the pecans, cinnamon and brown sugar. Set aside. In a large bowl, beat cake mix, oil, eggs and sour cream with mixer on low-speed for 30 seconds then medium speed for 2 minutes, occasionally scraping down sides. Spread half the batter in prepared pan. Sprinkle pecan mixture over batter. Carefully spread remaining batter over pecan mixture. Bake 44 to 48 minutes or until deep golden brown. Remove from oven and cool 5 minutes. In another small bowl, combine powdered sugar, milk and vanilla. Spread mixture over cake while warm. Cool completely. Store covered. This entry was posted in 52 Week Challenge, All-Occasion Cakes, Breakfast, Desserts, Entertaining, Kid's Favorites, Pot Luck and tagged breakfast cake, cinnamon, honey bun cake, pecans, yellow cake mix. Bookmark the permalink.